Bishop of Catholic Diocese of Sokoto, Most Rev. Matthew Kukah, said Nigeria`s unity could not be compromised and urged citizens to contribute to its greatness. He stated this on Thursday in Abuja at a national dialogue organised by the Savannah Centre for Diplomacy Democracy and Development. The theme of session, which was the third in the series of national dialogue by the centre, was “Nigeria`s Unity and National Integration: Threats and Opportunities for National Development“. 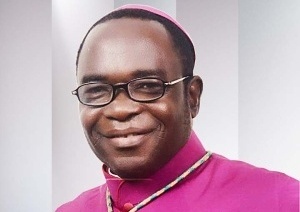 Kukah, who reacted to agitations by groups in the country, said that politics was strengthened by people having the capacity to express themselves. He, however, said that in spite of feelings in parts of the country, unity remained the focus of the country and that it was the responsibility of all to make Nigeria great and envy of other nations. “We cannot recover territory from Boko Haram only to surrender it to others; we are Nigeria and Nigeria will continue to remain. “This country belongs to all of us and I think it is important for us to understand that while the protester must have his voice, the one in power must also have his voice. “We are before the red sea; this may be Nigerian`s best moment. It is time for us to realise our collective venerability,“ he said. The Bishop added that the reason everyone existed in the country was because there was a Nigeria, and said that while Nigeria could exist without us, we could not exist without the country. He said that the challenge to all should be how to make Nigeria great, stressing that all stakeholders should work to ensure that. He expressed regret that the patriotism of most public office holders ended as soon as they were out of office. “Ministers become so patriotic when they are in office and I have seen them come down; no sooner had they lost their positions than their patriotism ended,’’ he said. Kukah decried the country`s present state and said that the political class should have seen it coming. “The political class has no time to reflect; we fumble and fumble through problems and we just think that the problems will go away,’’ he said. He said that it was time that some contradictions in the country were addressed. According to him, though we are in civilian administration, the country`s public space has been increasingly dominated by those trained to use monopolised and declared violence. The cleric pointed out that Nigerians did not just decide to become violent but that there was a direct correlation between the movement of small arms and how armed robbers got arms. This, he said, were some of the contradictions that led to the country`s present challenges, adding that some states lacked the capacity to address some issues of development. Prof. Ibrahim Gambari, founder of the centre and Nigeria’s former Permanent Representative at the United Nations, said that even the United States was still designing a perfect union for the country. According to him, the idea was to keep working at it so that there will be less dissatisfaction and more gratification, and an assurance that we are moving in the right direction. Gambari said that though personalities were important because they made a difference, leadership was key, and the Nigerian project was a project of all. He explained that the objective of the dialogue was to come up with realistic implementable and innovative ideas that would move the country forward. He said that the centre was poised to be part of national discuss, adding that it did not have to always agree on issues raised. Gambari advised that consensus was not built by creating enemies, but by engaging persons with divergent views. He said “from experience, parties to a conflict and disagreement stand their ground best when they are standing within a common ground“. He expressed optimism that panels at the session would come up with robust deliberation with actionable and viable recommendation for the country`s policy makers.